On March 8th, the pro-war activist group, Move America Forward, staged a rally at the Lafayette Crosses Hillside Memorial. Lafayette was the first stop on their cross country caravan to Washington, DC where they will demonstrate in support of the war on March 17th. The best footage can be came from KTVU with both a general report and a clip of a "debate" between an angry Goldstar father and memorial organizer Jeff Heaton. CBS Channel 5 and NBC Channel 11 also covered the story. The Oakland Tribune has run an article. 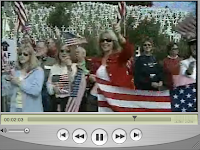 The rally called the memorial a mock cemetary that disgraces American soldiers. It seemed to me that they used the occasion to attack and discredit the peace movement rather than explain why an undefined and continous war on terror supports the troops. I say this because what I saw was flag waving and aggression, what I heard was hate, not a message. This might not be surmized from the videos above but my own footage should follow on Sunday. What you refer to as hate in your remarks seems to me to be anger, which I think is an expression of pain for many of these folks. From what I've read, many of these people are family members of soldiers who have died or are serving in Iraq, and they have the old-fashioned idea that if the president's war policy turns out to have been wrong, then their loved ones' sacrifices would fall into dishonor. I think they're wrong. (A soldier's honor, to me, comes from doing his duty—this is an even older-fashioned idea—not from the validity of the civilian leadership's policy.) Their pain needs to be recognized and their anger returned with love, not anger. At the same time, they should be made to see that people who oppose the war honor their loved ones' sacrifices. It's the president who dishonors them, by spending their lives cheaply. I spoke to Paul Thissen Staff Writer from the Contra Costa Times and expressed my issues and concerns with his reporting regarding the vandalism of the Lafayette Crosses on September 25, 2007. I would have liked as a homeowner not to have crosses at my home because it is an eye-sore and it hurts the property value with the understanding that the owner of the house is renting and leasing her lot out to put up the crosses. I told Paul Thissen my concern. I also mentioned to Paul Thissen that it is my belief that the Gold Star Mothers should not have been at this site in Lafayette because I don't want anymore attention than it needs to do and anymore hype will cause more Pro-War and Anti-War Rallies that is how I look at it. Paul Thissen than said to me when I finished what I said he told me to write to the Editorial of the Contra Costa Times.